Originally formed in 2006, the members of FRAMEWORK have been playing since early youth, were used to be called EXORBITANCE. These guys are hailing from the US, east coast, New Jersey to be exact, according to their bio, they have been playing Melodic Death Metal, a highly likeable cross of Metal, taking down a notch the brutal side of the traditional Death Metal. 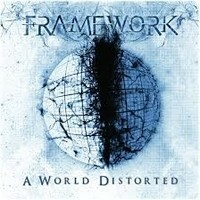 FRAMEWORK’s new album was named “A World Distorted”, regarding the review I will keep it short as possible as I believe that a hot prospect should be less talked about and more listened to. FRAMEWORK are on the way to success, bearing some great riffs spiced up with melodic parts. The only drawback I think was with the vocals by Glenn Ferguson. Don’t get me wrong, he is not bad, but I think that a more low pitched growling will be more appropriate for future releases. On the other hand, Ferguson has it in him to become great. Don’t miss “Beyond Earth's Shadow” an epic track with a nice video clip, “Without Wings”, a Doomish Death Metal with melodic atmosphere made to perfection, one of the tracks that you can listen to for six times in a row and I did. Also check out “The Code” with a long acoustic ambient intro that changes to a full blown Death attack, simply amazing. It took a year to record this album according to FRAMEWORK, I was puzzled at first for that comment, however after listening to the album I understood.